Today didn't feel as cold as the past days have, so I figured it was good opportunity to go for a run (well, a brisk walk) and put the fitness tracking capabilities of the Lumia 930 to the test. For comparison, I took my trusty Fitbit Zip along for the ride. 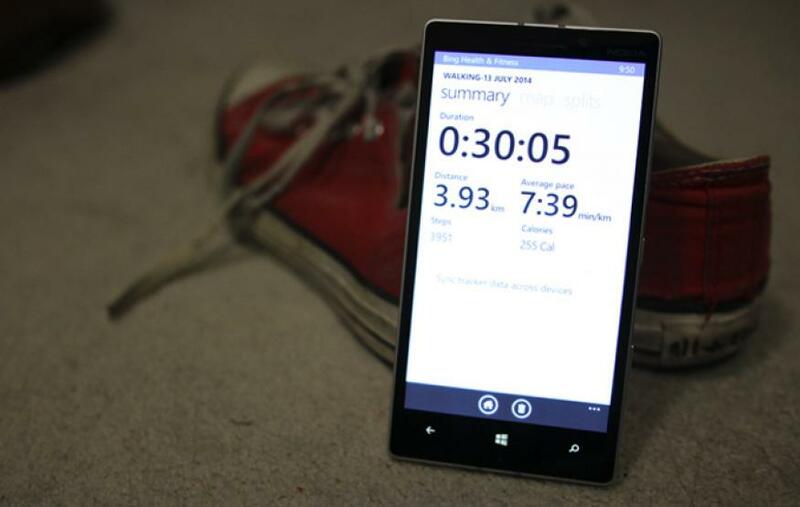 While the Lumia constantly tracks your steps, you can also enable a "GPS Tracker" during a workout. Aside from providing you with the distance you travelled, number of steps, average pace and calories burnt, the GPS tracker also generates a map of the path you walked or ran. When you start a GPS Tracker workout, you pick your activity and can set a goal. Goals can be based on either traveling a certain distance, or exercising for a certain time. My scheduled workout was a 30 minute walk. After the walk, the Lumia informed me I had travelled 3.9 kilometres at average pace of a 7:39 minutes a kilometre, and walked 3951 steps. Conversely, my Fitbit Zip said I travelled 3.2 kilometres and taken 4138 steps. The variation in steps taken was fairly minor, but this wasn't quite the case for distance. Funnily enough, the actually route I took was 3.9 kilometres (according to Google Maps) meaning both devices were a few hundred metres out. I should also note, the GPS tracking didn't seem to put too much extra stress on the battery. Despite the slight inaccuracies, the Lumia's fitness tracking works well and is a great feature to have in-built. While you couldn't take the Lumia for a swim as with a Fibit, and while you might not want to have the phone in your pocket when mountain biking, the functionality is useful and could remove the need for a separate fitness tracker for some. The Windows Phone health and fitness app also features a diet tracker / calorie intake counter and a symptom checker. I haven't extensively tested either, mostly because I haven't been sick, and I don't have the discipline to enter every meal I enter into my phone, but they're nifty features to have built into the operating system. Now that I've spent five days away from my iPhone, it feels like it would be pretty easy to make this switch permanent. I've been pretty impressed by the Lumia 930 so far, and I've made-do despite the smaller app library. Honestly, the two major factors that would stop me from switching to the Lumia are how heavily I'm engrained in Apple's ecosystem (my home machines are Macs), and the number of products I need to review that unfortunately don't work with Windows Phone. The fact my bank doesn’t have a Windows Phone app is a bit of a bummer, but I could deal with that. Otherwise, my Windows Phone experience has been great, and there's certainly a few features here that I wish other phones had.